Teva announced the launch of QNASL (beclomethasone dipropionate) Nasal Aerosol in a new 40mcg strength. 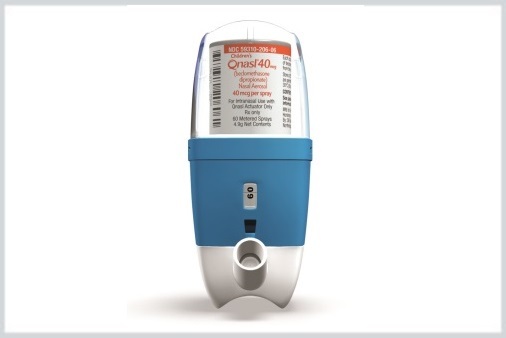 QNASL Nasal Aerosol 40mcg is indicated for the treatment of nasal symptoms associated with seasonal and perennial allergic rhinitis in patients aged ≥4 years. QNASL Nasal Aerosol is an intranasal corticosteroid that is extensively converted to the active metabolite, beclomethasone-17-monopropionate. Corticosteroids have been shown to have multiple anti-inflammatory effects, inhibiting both inflammatory cells (eg, mast cells, eosinophils, basophils, lymphocytes, macrophages, and neutrophils) and the release of inflammatory mediators (eg, histamine, eicosanoids, leukotrienes, and cytokines). The new QNASL Nasal Aerosol 40mcg has a built-in dose counter and is available in a 4.9g package containing 60 actuations. QNASL is already available in a 80mcg strength for use in patients aged ≥12 years. For more information call (855) 55-QNASL or visit QNASL.com.